GUITAR HERO: The guitar playing on Slash’s latest album, “Apocalyptic Love,” may be his best ever — which is saying a lot considering his previous output. More like a polished combo of “Use Your Illusion” and Velvet Revolver than the raw, punk-metal sleaze of “Appetite for Destruction” “Apocalyptic Love” is worthy of praise from even the stingiest of guitar snobs. To say it’s been a banner year for rock guitar hero Slash is like saying he has an appetite for the occasional pack of smokes. Besides rave reviews for his latest album, “Apocalyptic Love,” the former Guns N’ Roses outlaw was recently inducted into the Rock and Roll Hall of Fame. Sure, GN’R singer Axl Rose spitefully snubbed the ceremony (or maybe he’s just running late), but the recognition was deliciously wicked for a band that sold 100 million albums laced with hard-rock f-bombs and blatant excess. More recently in Los Angeles, Slash again was honored when he scored his own star on the Hollywood Walk of Fame. Compared to other sidewalk scores, the Walk of Fame ordeal was at least police-approved (although emcee Charlie Sheen may have raised a sniff of suspicion). Now mutually estranged from Axl Rose and the drama of a Stone(d) Temple Pilot (see Velvet Revolver), Slash brings his new “Apocalyptic” posse — singer Myles Kennedy, bassist Todd Kerns and drummer Brent Fitz — to Stubb’s on Friday where career-spanning hits like “Sweet Child O’ Mine,” “Paradise City” and “Slither” are all fair game to be pulled from his hat. ALBUM OF THE YEAR? In a year that’s seen impressive releases from Van Halen, The Cult, Aerosmith and The Last Vegas among others, Slash has a serious contender. Lest anyone think Slash’s best playing rests with Guns N’ Revolver, “Apocalyptic Love” proves he’s got plenty of bullets to spare. A hard-boogie grinder full of slinky blues and ballistic solos, “Apocalyptic Love” may be Slash’s finest hour. At the very least, the solos in “Anastasia” could stop a conversation between Al Di Meola and Eddie Van Halen. It ain’t bragging if it’s true. In Kennedy, Slash has a powerful all-terrain vocalist. Whether wailing and growling like Axl Rose or fanning the low-spark soul of Steve Winwood, Kennedy proves to be a full-time keeper after first appearing on Slash’s 2010 solo album alongside guest vocalists such as Ozzy Osbourne, Dave Grohl, Fergie and Chris Cornell. Welcome to the jungle, indeed. 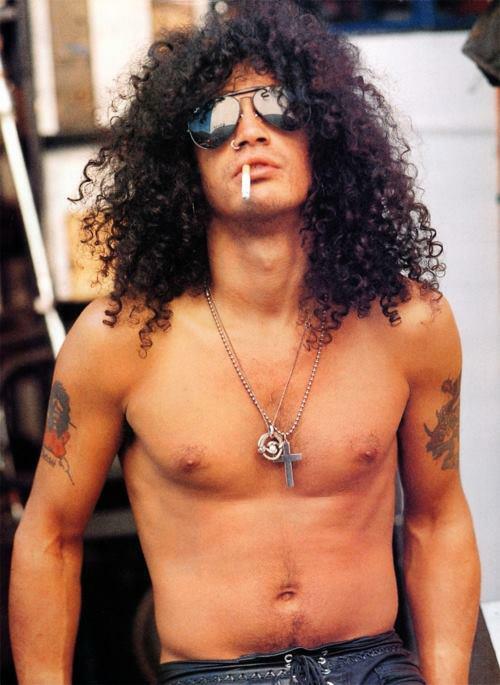 SMOKE MY CIGARETTE WITH STYLE: After decades of huffing cigarettes, Slash finally gave up the filthy habit of wearing shirts. 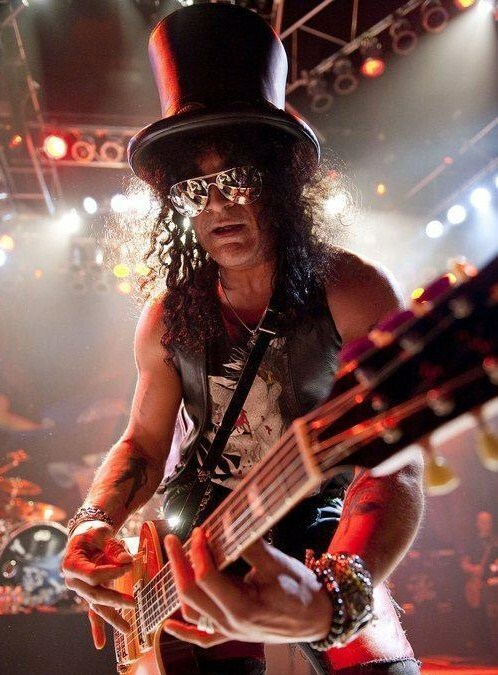 Born Saul Hudson in England, 47-year-old Slash was raised in Los Angeles where he attended school with Lenny Kravitz. His mother worked for, and reportedly romanced, David Bowie. After an early audition with Poison, Slash found universal fame with the more compatible Guns N’ Roses, whose blockbuster 1987 debut, “Appetite for Destruction,” is considered one of the greatest rock records of all time. Before falling out with Axl Rose in 1996 following GN’R’s “Lies, Lies, Lies,” the double-album “Use Your Illusion,” and the covers collection, “The Spaghetti Incident?” Slash recorded two albums with his side project, Slash’s Snakepit, and eventually joined ex-GN’R mates Duff McKagan and Matt Sorum in the all-star Velvet Revolver featuring singer Scott Weiland of Stone Temple Pilots. To date, Slash has collaborated with such legends as Michael Jackson, Iggy Pop, Bob Dylan, Elton John, Stevie Wonder and, um, “Phineas and Ferb. MYLES AWAY: After a stint with former members of Creed, singer Myles Kennedy is now riding shotgun with Slash. 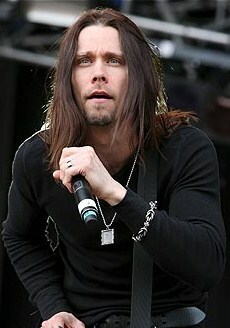 Boston-born musician Myles Kennedy first gained national prominence in 2004 as the singer for Alter Bridge, which was basically the massively successful band Creed minus singer Scott Stapp. More importantly, he also made a closing appearance in the 2001 film, “Rock Star,” featuring Mark Wahlberg and Jennifer Aniston. That’s him climbing out of the crowd to replace Wahlberg as the totally stoked singer for the totally rad Steel Dragon. 2Fast2Die Note: The text of the above article originally published in the Austin American-Statesman on Sept. 6, 2012 under my “professional” byline, David Glessner. Gotta pay the bills, ya know? Great writing, as usual, MD! 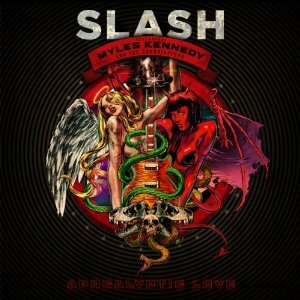 I’d say Apocalyptic Love one of the album’s of the year.. Your spot on about “Anastasia” some truly killer solo’s from Slash.. Having seen him twice this year he was on fire..
Great feature as always Dave.. Not been on Facebook yet re-post this! !